Custom fit, lightweight titanium brace offers our top ACL protection for non-contact sports and some football positions. IS THE A22 CUSTOM KNEE BRACE FOR ME? When speed and performance during sports matters, you don't want to get slowed down with heavy, bulky braces. The DonJoy A22 Custom Knee Brace provides a balance of weight, strength and support to keep you healthy and protected while performing your favorite daily activities. Lightweight and low profile, the DonJoy A22 Custom Knee Brace offers the maximum knee protection for athletes who don't encounter aggressive physical contact (can be ideal for quarterbacks, defensive backs, wide receivers or safeties) and for athletes participating non-contact sports. Wearing a custom knee brace means the knee brace aligns to your body, maximizing the support where you need it most. Get back to your sport in confidence. Note: The DonJoy A22 Custom Knee Brace is ideal for non-contact sports and can be ideal for quarterbacks, wide receivers, defensive backs, and safeties because they don't encounter aggressive physical contact. Linemen and athletes who encounter a great deal of contact may want to consider the DonJoy Defiance III Custom Knee Brace. The Fourcepoint Hinge Technology helps to reduce the amount of time your knee is in an "at-risk position". The DonJoy A22 Custom Knee Brace is one of the first titanium knee braces that's custom made for your knee to ensure maximum knee protection. The low-profile, aerodynamic integration of the straps and liners make this custom knee brace light and less bulky so it won't get in your way during activity while providing the best protection for ACL injuries. When you order a DonJoy A22 Custom Knee Brace, one of the DonJoy bracing experts will contact you after your purchase to schedule a fitting appointment. Then DonJoy will customize a brace to fit your exact measurements. The customized fit ensures all the components of the brace align perfectly with your body for maximum protection and comfort during movement. With the risk of ACL injuries and even a second tear, it's extremely important to protect your knee ligaments. A person who has torn their ACL has a 15-time greater risk of another ACL injury. The risk of an ACL injury to the opposing knee is 2 times that of the reconstructed knee. These stats confirm the importance of supporting your knees during any activity. The A22 Custom Knee Brace is the bracing solution to keep you active and performing. If you are involved in contact sports like football, motocross, or skiing we recommend the DonJoy Defiance III Custom Knee Brace. When you order a DonJoy A22 Custom Knee Brace, it will be custom fitted by one of the DonJoy bracing experts in your local area. Upon placing your order, we will contact you to schedule an appointment with a local representative to take your custom measurements. Because the DonJoy A22 Custom Knee Brace is custom fitted and sized for your knee, this product does not qualify for the regular BetterBraces.com 30-Day Money Back Guarantee or other general returns. Remakes will be done for any manufacturing defects free of charge. Rest assured that DonJoy will work with you to make sure you get a satisfactory and comfortable fitting brace. Note: The DonJoy A22 Custom Knee Brace is not available outside the United States via BetterBraces.com. If you are outside the U.S. please email us and we will direct you to the proper outlet in your country. Hello, I recently underwent a reconstruction of my ACL and meniscus. I am 20 y/o and currently playing college basketball. The new ACL was constructed using a piece of my hamstring from the same leg and 2 cm of cadaver . I am extremely active and will be returning to my sport in November. I need a strong lightweight brace that will be able to take somewhat of contact. What brace will be best for me and which one will I have better results from? I was looking between the A22 or the Defiance III . The Defiance III would be the better option, as the A22 is not suggested for contact sports. My surgeon is recommending I get fitted for a custom brace post ACL surgery, mainly for skiing, but also for tennis, basketball, soccer and surfing. I'm in between the A22 and Defiance III. I like the idea of the A22 being lightweight and comfortable (I'd be more inclined to wear it), but noticed it doesn't come in the short calf version, though it has a hybrid height. Will it fit above my ski boot (I'm 5'11")? For my needs, would you recommend the A22 for me? Last, is the A22 waterproof? The A22 comes with a hybrid calf length which is 7 inches from the center of the condyles to the bottom of the brace. The total length of the brace is 15.5" Yes, you may wear it in water. The A-22 would be a good choice for you. Where can I get replacement pads and straps for the braces? Is this the best answer as a brace played during football? I really like this brace and want to be able to use it during football season. No. The A-22 is not made for contact sports. You need something that is stronger and will withstand contact with other players. If you are wanting a custom brace you could look at the Defiance ll Custom Knee Brace. I am an 18 y/o female that will playing college softball in September. I just had a complete tear of my ACL and a lateral meniscus tear that was repaired via scope. The new ACL was constructed using a piece of my hamstring from the same leg. What brace do you recommend knowing I will be playing softball and will for the next 4 years at a very competitive level. Chronic Patellofemoral pain, both knees. Lateral release surgery, both knees. Major instability, both knees "give way". Adventure motorcycle rider so this is a tad problematic. Need maximum amount of dynamic protection and support against joint instability and lateral tracking. 1. Can I order the A22 with Tru-Pull Attachment? 2. If so, what other options are available? 3. Even if this option is available, in your opinion, would it be effective kneecap/patella support? 4. What are some other comparable options? The Tru-Pull Avanced Attachment cannot be added to the A22 custom knee brace. The Defiance would be a suitabkle substitue. My son, 15, tore his ACL while playing basketball. His surgeon gave us a prescription for a custom brace and would like for him to use it for about a year, after he clears him which will be in about 3-4 months. Two questions, which brace do you recommend for this sport. Second, since the brace is custom, and the doctor wants him to use it in his rehabilitation, is he going to have a problem with outgrowing it? I tore my MCL surfing last fall and am looking to get back out this month. Am a female, size 2, and looking for something supportive and not too heavy. Is this sufficient for surfing? Is this brace suited for surfing? I have reoccurring meniscus and mcl issues after surgery and no typical brace has provided the correct support to the knee. With my high level of surfing my knee is put under lots of stress of the knee bending inward and twisting which is how I initially injured my knee. What would be the best brace for a competitive level of surfing? Hello, I recently underwent reconstruction to my ACL, PCL, LCL and repair to my MCL. I'm 24 years old and an ex D1 soccer player who would like to get back on the pitch. Which brace would you recommend for me? Thank you in advance. How much does it weigh? How come it shouldn't be used for football? The brace weighs 19.2oz and the frame is made of titanium which is stronger than aluminum but not as strong as our carbon fiber brace the Defiance. We cannot guarantee that the frame will withstand contact that will happen during football. I have used my defiance don joy brace for about 5 years while playing softball and I am looking into a newer up to date brace like the a22. I just had my 2nd acl surgery and my meniscus repaired and I want to still play at a high level for the next 5 to 10 years. Is this brace a better version of the defiance or just a more compact lighter one? Deciding between A22 and Defiance. I work in a hot climate and am concerned about slippage. I like the profile of the A22 more but am concerned about movement. Is one better with this than the other? Hello, I have recently had a surgical procedure done due to ACL tear. My doctor said that I won't be needing a brace. Do you recommend me getting a brace since I play college and which knee brace do you recommend?? And will it bother me or not while playing? You should speak to your physician further about wearing a brace while playing college athletics. I can tell you that one of our braces with the fourcepoint hinge such as the A22, and Full Force Ligament knee brace have been clinically proven to help prevent re-tear of the ACL up to 50 %. The hinge has a dampening effect that will slow down the last 20-25 degrees of knee extension which keeps the knee out of the "at risk" position. I had ACL reconstruction in both knees about 22 years ago and now at 38 - I found out my meniscus is torn and I'm ACL is hanging on by a thread. Due to arthritis in my knees ACL surgery is not an option again. What brace would you recommend for exercising or playing with my kids. A functional knee brace will provide your knee with the stability it is missing from the ACL. If you are looking at a "off the shelf" brace then take a look at the FullForce Ligament knee brace. If you would like a more custom fit the A22 is a great option. Both braces off ther Fourcpoint hinge witch will offer the best ACL protection. I am looking for brace primarily for hiking/backpacking where my main worry is with descending down. I have hurt my knee that way taking big steps descending down and now I am extremely careful and have considerably slowed down my pace to protect my knee. I am otherwise fast hiker though, by some standards rather an extreme hiker because I have hiked 30 miles in a day gaining 9000 ft in elevation and losing the same. I am deciding between armor, defiance III and AC22. I definitely like the low profile, titanium and less weight which is ideal for what I want to use it for (keep weight minimum, maintain good pace). But will it be able to handle hiking downhill on rocky terrain with decent pace? Is the other braces has any advantage over it in terms of performance? I also intend to use it for tennis, running. The A22 is an excelent choice for you. 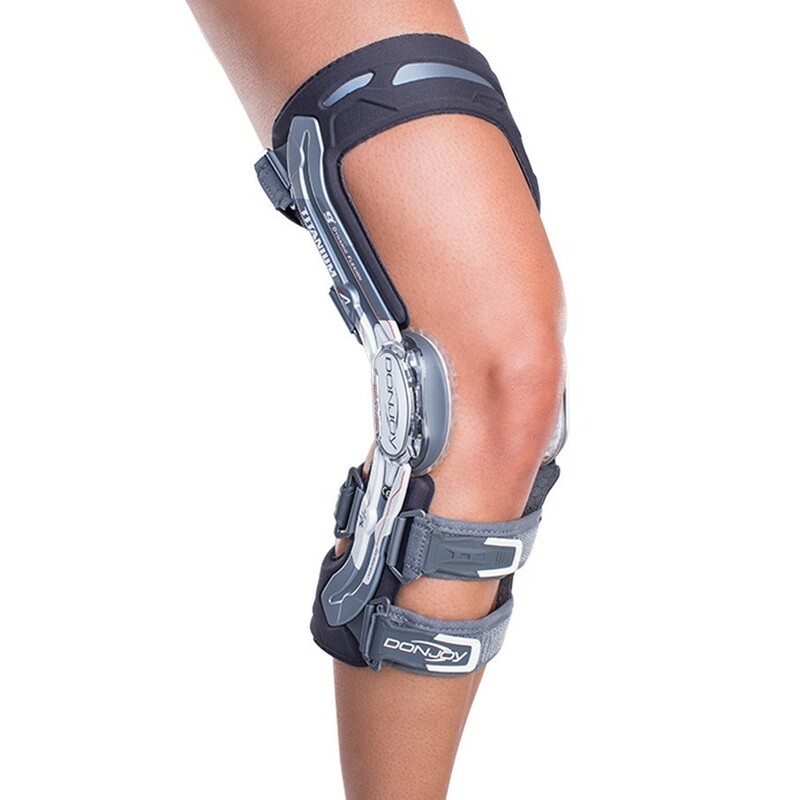 The brace is going to offer you maximum support and prevention of ACL injuries and can be worn during any activity. Hi, does A22 come with short calf option? The A22 comes with a hybrid calf length which is 7 inches from the center of the condyles to the bottom of the brace. The total length of the brace is 15.5"
I was just curious if I could find out where these sizing experts are located? I live in a more rural area in Montana and would like to know this information before I buy this brace. Thank you for quesiton. Any of our Brace Advisors can assist you with sizing questions. Please contact a Brace Advisor for assistance at 800-553-6019. Hi, I have a ruptured left ACL and am having surgery in the next couple of weeks. I'm an ice hockey player as well as lacrosse. I am trying to decide which brace, the A22 or defiance III would be better. Hi, I had acl recon surgery a year ago. now I am getting back to sport. I mainly play basketball and mountain biking. which is a better fit for my activities, A22 or Defiance? I play linebacker in football. Would this brace be good for this? I also run track. I had ACL recon surgery about 2 months ago, and am looking for a good sport brace. I play football, run track and dance. My Dr. recommended FullForce brace, but with so many I don't know which one to get. What brace would be best? If you are looking for something with more support you can go with the Don Joy Armor Knee Brace in a short calf version. Hello, I had acl reconstruction and after the rehab my knee is very strong, i am using my donjoy armor just to be able to play with confidence, so the question is why should i change my armor for an a22? What's the weight of the a22? Does the A22 also come in an osteoarthritis brace ? As an offloader like the Custom DonJoy OA Defiance ? I just recieved a new Fource Point A22 Custom Knee Brace purchased fro by the Veterans Admin Hospital, there was absolutely no problem getting used to the brace. My question is; how do I purchase more A22 undersleeves? It came with 1 but I would like to purchase more of the undersleeves. I have a fully torn ACL in my right knee and a partially torn ACL that I have rehabbed in my left from a prior injury. As a police officer who still works patrol, would the A22 be a good choice for both knees or the Defiance III? I like the idea of low profile and lighter weight for 10 hours shifts but def need the protection. Thanks! The A22 would be a good choice for both legs. The brace is light weight and low profile but still has all of the technology to protect the ACL. Diagnosed with Grade 2 PCL injury. Recommended this brace but warned that is not on the market yet. I see it now on your website and wonder if i could order it here. If not available, I would appreciate an advice on alternative options (less cumbersome, possibly wrap-around style). I cycle and run. Thank you. I have some serious knee issues. I have had 3 prior surgeries on my left knee. My last 2 were lateral and medial meniscus tears. I have nothing left and I am stage 4 OA. I will eventually need a knee replacement. Could this particular brace still work for the injuries that i have? I like the fact that it is custom made for the individual person. I want a good fit if I am still going to be active (functional fitness and/or possible crossfit). I will eventually need a knee replacement. I am hoping this custom made brace would be useful for me. Or is there other custom made braces for active sports that will eventually need a knee replacement? thanks. I tore my ACL in December . I was on crutches for 2 weeks before I got my A22 knee brace. As soon as I put it on I put the crutches down. The A22 is the real deal! This is the 2nd time I have tore the ACL completely. I will not have time to have surgery till mid to late April. This brace lets me walk,climb,and work all day with no pain..also keeps my knee stable. The A22 is a great light weight brace for sports that don't include aggressive physical contact like football, rugby, etc. I wear the A22 for basketball after my second ACL reconstruction. I've had it for about a year and couldn't be happier. The only drawback is the top strap is not long enough. I was told they were all made this way and it barely makes it around. I recently had to ship it back for Donjoy for an adjustment. I put the brace on 4 days after arthroscopic repair (15%) of my medial meniscus and diagnosis of ACL almost 100% torn. The company rep was fantastic. The brace immediately improved my comfort as well as my ability to begin rehab exercises. I feel like wearing it all the time. Pros: Snug and stable fit. Joint articulation seems to be improved and pain decreased significantly at rest or with any movement or exercise. I haven't done any vigorous training yet. The sleeve is very nice too but I may need to size up from a small on this. Cons: Straps are not perfect - the juncture where the strap goes from material to velcro is right that the turn in the buckle and this juncture has an edge that catches when I thread the strap through the buckle.